Where is the Edge of Your Comfort Zone? In order to step out of your comfort zone you need to know where it ends. You need to understand where you are limited and what is limiting you in your progress forward. You probably already have some idea where the edges of your comfort zone are, for some things at least. You can feel when you step out of your comfort zone – you start to feel uncertain about what you are doing and what is going to happen. You feel excitement and also fear about the future. You feel excitement because doing something new is exciting; it is a new opportunity. You feel fear because you don’t know how to do it so you might not do it right. You also behave a certain way when you step out of your comfort zone. Maybe you start to procrastinate about things, maybe you have a certain set of negative self talk, or perhaps you become irritable. Those sort of behaviors are natural and allow you to notice being out of your comfort zone. The only way to succeed is to be out of your comfort zone. It is OK if you fail – it is part of the process and not the end of the world. Marcus Taylor (link to his page) developed the world’s first comfort zone measurement tool – the comfort zone survey. This survey gives you a measurement of the size of your comfort zone. He developed the survey to make more people aware of comfort zones and to explore comfort zones. He describes his measurement survey, how it was developed and what he learned in the video below. You can measure your Comfort Zone at Marcus Taylor’s website, What is My Comfort Zone. 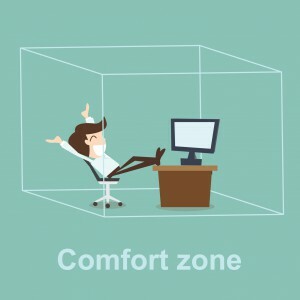 It takes about 5 minutes to complete and measures your overall comfort zone by averaging three comfort zones: your professional comfort zone, your adrenaline comfort zone and your lifestyle comfort zone. Take the survey and then come back to compare to the average values in each area! Taylor, Marcus. 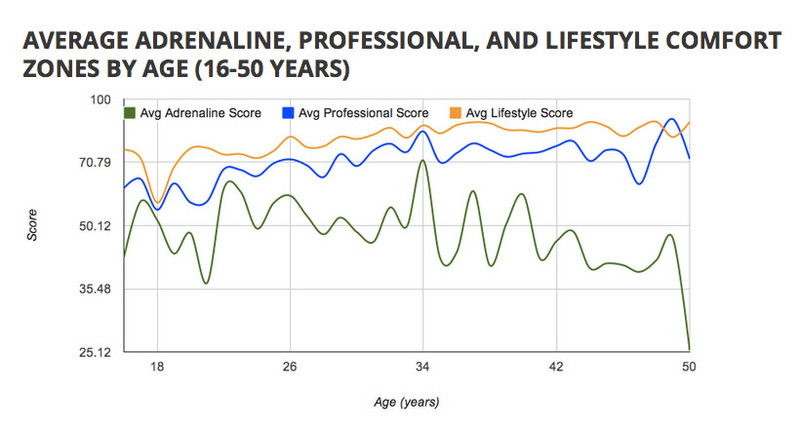 Average Adrenaline, Professional, and Lifestyle Comfort Zones by Age (16-50 Years). Digital image. How Does Your Score Compare? N.p., n.d. Web. 29 Mar. 2015. <http://www.whatismycomfortzone.com/comfort-zone-trends/>. Mr. Taylor was able to draw some interesting conclusions from the data obtained in his “What is My Comfort Zone” project. He noted that people with larger comfort zones (as measured by his survey) earned more money. He also noted that males had larger overall comfort zones on average than females. Females had larger “lifestyle” comfort zones, but males had larger “adrenaline” and “professional” comfort zones. Our comfort zones also change as we age depending on how we continue to challenge ourselves. This groundbreaking work is the first step in allowing you to explore and monitor your comfort zone expansion! Take the time to think about and measure your comfort zone and see what you can learn about yourself. Regardless of what your current comfort zone is, you can always grow and expand it! Getting use to stepping out of your comfort zone allows you to grow and thrive. It gets easier each time you do it! So take the step! Getting outside of my comfort zone is the hardest yet challenging thing I can. As much as I like to be inside of it, I know getting out of it is a good thing. Thanks for the wonderful post. Thank you for visiting and you comment. It is much appreciated! I agree with the speaker, that ‘it starts with an “idea” of what you can or can not do” as that alone determines and tells a lot. Another statement he made which always strike a nerve every time I hear this is ” if you want something you, don’t already have; You have to do something, you haven’t already done”…Always and forever true! Believe it or not, some people still have a challenge “getting this”…but that’s okay, because I know the feeling as I’ve been there. Until, I changed my mindset due to awareness and education. Yes, it’s weird but sometimes we really do have to be taught the right way to think. That’s it for now, as I’m going to measure my comfort zone..lol..Later. I know I find myself repeating actions that haven’t worked in the past expecting a different outcomes – then I realize what I have done! I hope you enjoy the comfort zone measurement! Thank you for the comment and the visit. What a great post! Getting out of your comfort zone is very hard to do but I believe you accomplish more when you leave your comfort zone. You got to face those personal fears like the Measuring Comfort Zone video said. Thanks for the info. Thank you for coming by and reading the post! I hope you enjoyed measuring your comfort zone. I agree with the fact that you have to get out of your comfort zone to achieve anything in life. When i saw the video where he shows that your annual income can have an effect on your comfort zone, I could easily refer to myself. That’s great! I am glad you could personally relate to a portion of the content. I also find that when I step out of my comfort zone I break new ground and make more money. Thank for visiting and the comment. That is a great topic. I have always been uncomfortable going outside my comfort zone but am getting much better at it. The funny thing is, that once you do it, you realize that it really wasn’t that bad! Thanks for the information! Exactly! It is the fear of being uncomfortable or perhaps the fear of the unknown that seems much worse than it actually is! Thank you for visiting and your great comments! Great Article, I have trouble with this myself. It is nice to read more information about it .